The Minority Fellows Program (MFP) 2016 is a fellowship competition for individuals from underrepresented backgrounds applying to or in the early stages of doctoral programs in political science. The MFP was established in 1969 (originally as the Black Graduate Fellowship) to increase the number of minority scholars in the discipline. 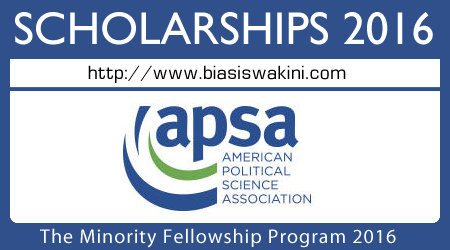 Each year, APSA awards up to 12 funded fellowships in the amount of $4,000. 0 Komentar untuk "The Minority Fellowship Program 2016"